Reports in Portugal have constantly linked Sporting CP star Bruno Fernandes with Manchester United and the latest update should delight the Old Trafford faithful. Last week, A Bola reported that the Red Devils are in pole position to sign the Portuguese international, who has got a huge release clause of 100 million euros (£86million) in his contract. 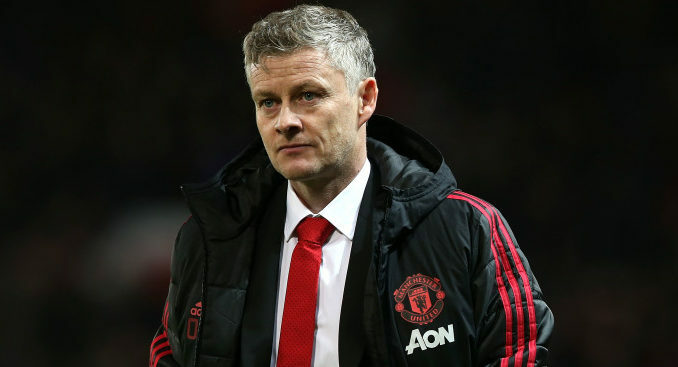 Now, Correio da Manhã have revealed that Man Utd are ready to move in with an offer at the end of the season to secure the signing of the 24-year-old attacking midfielder. It is mentioned that the release clause of the player is 100 million euros but due to weak financial situation, Sporting CP could lower the price. As per Correio da Manhã’s own information, the president of the Primeira Liga club wants at least 70 million euros (£60million) for Fernandes. The versatile attacking midfielder played abroad in Italy but he was just an average player in the Serie A. However, he has been in top class form for Sporting CP, especially this season. In the current campaign, so far, the former Udinese player has scored 28 goals and provided 15 assists in 47 appearances for the Portuguese club. 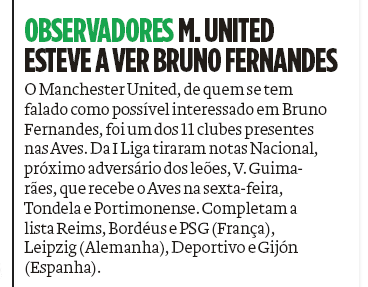 As per O Jogo (press image via Sport Witness), on Saturday, a Man United official was present to watch Fernandes play against Deportivo Aves. The attacker impressed, he scored a goal and helped his team win the contest 3-1 away from home. He made his debut for the Seleccao back in 2017 and so far, he has made 11 appearances for the senior national team and scored one goal. As far as United are concerned, we do need a top quality star, who can effectively play in the hole behind the main center forward and Fernandes perfectly fits the bill. Hopefully, we can get his signing done. In your view should United splash £60million to secure his signature? Yes of course, his a fantastic player and still young he can develop to be one of the brightest midfield in the english football history alongside Paul,Fred,Mctominay and co.